Museum visitors, park-goers, and the general public are invited to visit the mobile studio situated just outside the Queens Museum, which is hosting artist Matthew Jensen and his project A Collection of Walks (or How to Get to the Earth). 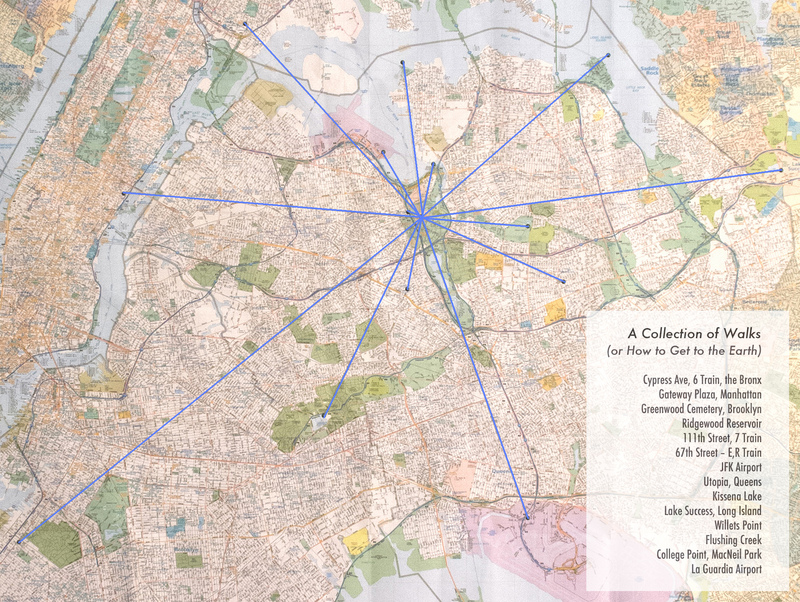 Matthew Jensen is the artist-in-residence for Studio in the Park: the ArtBuilt-Queens Museum Mobile Residency Studio Program in Flushing Meadows Corona Park from July 16 through August 16, 2015. During his four weeks Jensen is using the mobile studio to carry out his project, A Collection of Walks (or How to Get to the Earth),consisting of walking to the Unisphere from 14 different landmarks throughout New York City; many points in Queens, as well as some in the Bronx, Manhattan and Brooklyn. While walking each route he is collecting objects, information and taking photographs. Everything he collects is being brought together inside the mobile studio in the park, which will evolve into a cabinet of found curiosities. All of his experiences and findings will eventually be contextualized into a walker’s guide and photographic series. Jensen’s process is rigorous but meditative and demonstrates a commitment to the experience of public landscapes. Recently, as part of Crossing Brooklyn at the Brooklyn Museum, he designed and distributed Walking Flatbush, a guide to the 11-mile walk from the East River to Jamaica Bay. The inspiration for his project in Flushing Meadows Corona Park is the famous map to earth inscribed on the Voyager Golden Record, which was launched into space in 1977. In place of the 14 pulsars, Jensen has picked 14 New York City landmarks of note. Each of his walks will start at the landmark and end at the Unisphere. The Unisphere is the largest scale model of the globe on the planet and has been a visual and cultural landmark since its installation in 1964. Artist Bio: Matthew Jensen is a Brooklyn-based interdisciplinary artist whose work combines walking, history, photography and collecting. His practice brings special attention to the experience of landscape, particularly public space. Jensen has exhibited at the Metropolitan Museum of Art, Brooklyn Museum of Art, Brandywine Museum of Art, Delaware Center for Contemporary Art, Wave Hill, Third Streaming Gallery among others. His solo show Feels Like Real was on exhibit at Yancey Richardson Gallery this past spring and in November his series The 49 States will be exhibited at the National Gallery of Art. He has participated in residencies at the MacDowell Colony, L.M.C.C., Wave Hill and Kimmel Harding Nelson. Jensen currently teaches at Parsons/The New School and SUNY Purchase. He received his MFA from the University of Connecticut and BA from Rice University. Matthew’s work and projects have been featured in The New Yorker, WNYC, The New York Times, The Huffington Post, Phaidon.com, Whitewall Magazine online and the Hartford Courant. Artist Services at the Queens Museum are made possible in part by a generous grant from The Scherman Foundation’s Katharine S. and Axel G. Rosin Fund. Additional support provided by the New York City Department of Cultural Affairs and New York State Council on the Arts with the support of Governor Andrew Cuomo and the New York State Legislature.